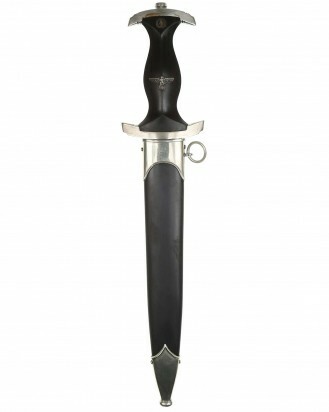 SS [Schutzstaffel] Honour Dagger in early Version. Modell 1933. The dagger is in EXC++ condition throughout. 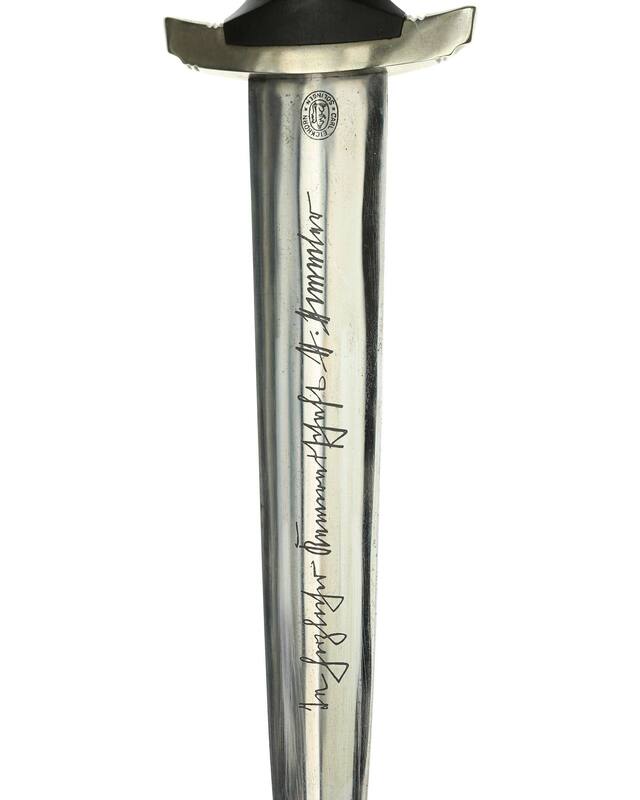 This early SS Dagger is with full H. Himmler inscription by Carl Eickhorn Solingen. Grip: Early nickel-silver pommel nut and crossguards show light surface wear/age patina with the underside of the lower crossguard stamped with the bench number “4”. The crossguards are internally marked, “H * E”. The early ebony grip shows light surface wear with surface chipping adjacent to the obverse lower crossguard, as well as a tiny hairline crack on the upper obverse grip extending from the crossguard to the upper edge of the SS insert. The grip features early quality grip-to-crossguard fit, and both the nickel-silver eagle and SS insert are properly inset with no chipping. Blade: Mirror polished blade grades near mint showing light runner marks, minor gray speckling, no damage to the blade tip. The crisp, deeply etched SS-motto Meine Ehre heißt Treue «My honor is loyalty» and Himmler inscription In herzlicher Kameradschaft H. Himmler retain 100% of the medium gray background frosting. The reverse ricasso of the blade is matching-etched formed by the firm's name and location, “Carl Eickhorn Solingen”, serrated tail squirrel within small double-oval TM. The blade shoulders perfectly meet the lower crossguard contour. Scabbard: Dent-free steel scabbard retains approximately 98% of the original anodization and factory lacquer with no crazing or oxidation. Nickel-silver scabbard fittings with unturned screws. Accompanying the black leather hanger with early nickel-silver buckle.